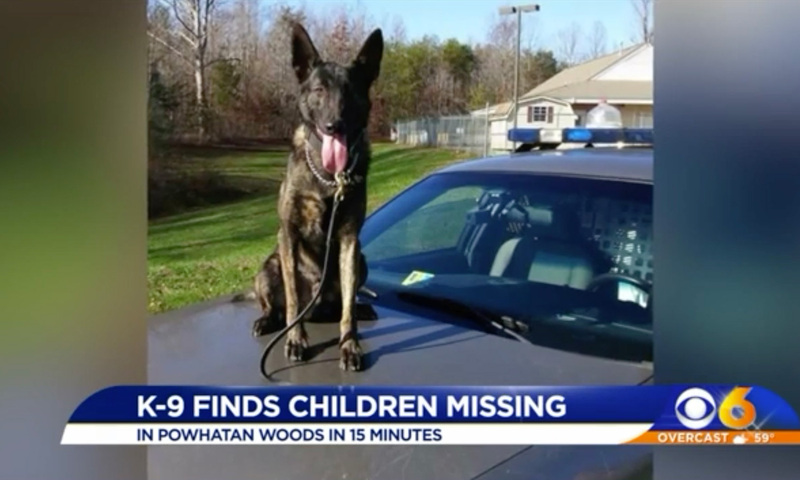 POWHATAN COUNTY, Va. — A Powhatan Sheriff’s Office K-9 is being celebrated for his quick work tracking down two children who got lost in the woods in rural Powhatan County Saturday night. Deputies said parents and neighbors had been searching the woods for two missing 8 year olds for 45 minutes — as daylight faded — before they called the Powhatan Sheriff’s Office. “Job well done K-9 Bane,” deputies posted. Bane, a Dutch Shepherd and Belgian Malinois mix, joined the sheriff’s office in 2016. His partner is Deputy T.Q. Pasi.